Over the summer, my best friend's teenage sister told me about a movie that she couldn't wait to see. She told me that the new "in" reading for girls her age was vampire romance novels. And they had finally made her favorite book into a movie... Twlight. Oh goodness. I was pretty convinced that I could resist this fad. What kind of interest did I have in reading books about vampires? Then, my roommate, the movie theater manager, started talking about this movie he had screened that he really loved. It was about vampires... So. cool. He immediately started reading the series and has already finished the third book. But, really, do I need to start a new book series? My schedule is already full with scholastic reading right now... must resist. Next, I started school for the quarter. My favorite colleague and study partner drives me to school everyday (because she is awesome). She mentioned needing to stop by the bookstore to pick up the second book in a series she has been reading. As she reached for the book, my heart skipped a beat as I was starting to recognize the extended hands holding an apple. She was already on the second book of the Twlight series... I'm starting to think this is a sign. I can't get away from this. The last straw was when I started looking for my "B." My thought was that I could combine my need for a new knitting project and an entry for B. I decided to start looking through my ravelry favorites for a project that started with B. The first project that I came across that fit my current needs of "fun, quick, portable and starting with a B," was Bella. As I start to read the description of the pattern, I realize there is no avoiding the inevitable. The pattern was written after the writer saw the movie - TWLIGHT- and loved the main character's mittens so much. I've given up. I have cast on the mittens and started reading the first book. Really, I'm not sure why I resisted so long. So far I am loving both. 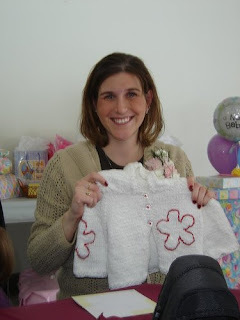 It doesn’t seem like very long ago that I made this Daisy Hoody for my soon-to-be neice, Alexa. I was so excited to have an excuse to make baby clothes. Even if she never wore it, I had a blast making it! Every time we see her, she has grown and learned new skills. It wasn’t long before she had started to crawl and had the bumps to prove it. By this summer, she was already this little person. She had a great time at a family picnic on the same type of slide that I had as a child. It is funny how some simple toys have lasted when there are such technologically advanced toys available (leap frog anyone?). She is 21 months old now and so much fun. At Christmas, she was able to hand out all the gifts (“This gift is for Uncle Butthead” – my husband, hehe) and open her own presents. She then played doctor with her new toys. I just can’t get over how smart she is. …I am not a proud Aunt at all, just in case you were wondering. Hehe.